The upcoming civic election has Vancouver anti-captivity activists rolling up their sleeves again. This time, they are fighting to preserve their gains from last summer, a long-overdue win that saw the city's Park Board ban cetacean breeding and introduce independent public oversight of the Vancouver Aquarium. With a new Park Board due to be elected in November's civic vote, the aquarium and its political allies are maneuvering, if not manipulating, to have the bylaw overturned. "Everything we managed to achieve last summer for Vancouver's captive cetaceans - all that hard work, by so many people, is at real risk of being torn up and tossed away by a new Park Board," says Marley Daviduk of the Vancouver Animal Defense League. "This has been the aquarium's fallback plan all along, so it's not unexpected, but it's a very real danger." That danger comes in the form of Kirk LaPointe, mayoral candidate from the right wing "Non-Partisan Association" (or NPA). LaPointe has pulled no punches about his unwaivering support for all things Vancouver Aquarium, saying he "deplores" incumbent Mayor Gregor Robertson's stance against cetacean captivity and promising to overturn the recent bylaw changes if he is elected. He's even hedging his bets. In late July, LaPointe approved the candidacy of Sarah Kirby-Yung on the NPA Park Board slate. Kirby-Yung was the vice president of marketing and communications for the Vancouver Aquarium from 2008 to 2010. "People should be appalled at this kind of underhanded politics," says Daviduk. "What if it was Kinder Morgan trying to sneak one of their own onto our elected bodies, just so they could force oil pipelines through our city?" While this tactic doesn't yet appear to be part of LaPointe's pipeline plans, he is increasingly being questioned about campaign donations from the oil and gas industry. In addition to promising less oversight of the aquarium, he has come out as a strong supporter of building LNG terminals in the city, and has spoken out against incumbent Mayor Gregor Robertson's pointed opposition to the Kinder Morgan pipeline expansion, projects that have generated massive and widespread opposition in the province. If plans were to proceed, the increased tanker traffic off BC's rugged – and dangerous – coastline, and the inevitable spills that will occur, put BC's already troubled wild orcas and humpback populations at risk. "An NPA-led city hall will put our wild orcas, porpoises, seals and sea lions, birds, salmon and more at risk, for what? Money. 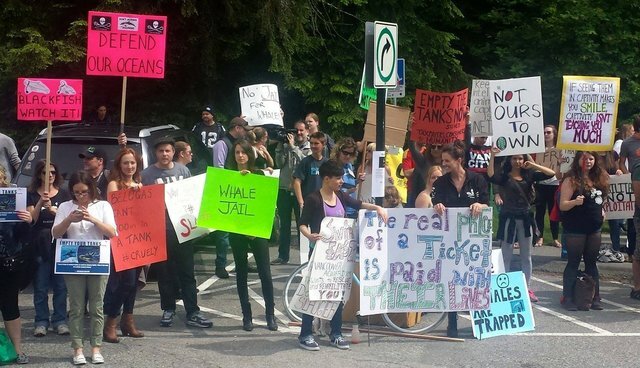 It's the same reason they want to see whales imprisoned at Vancouver Aquarium forever. Because people are making money off them." Daviduk, a tireless animal defender and veteran of several Sea Shepherd campaigns, was one of the Cove Guardians who narrowly escaped the 2011 tsunami. She says that, like Taiji, the Vancouver election shows that the fight for captive whales and dolphins is also a fight for their wild brothers and sisters. "Whether it's wild whales or captive ones, people need to understand it is the same fight," she says. "We are fighting the same people, motivated by the same thing – greed. What it comes down to is that we're fighting to fix our broken relationship with nature." Follow the Vancouver campaign to preserve the cetacean breeding ban at Vancouver Aquarium at www.vanaquafacts.org and follow them on facebook and twitter.